Moxtek has achieved low cost, wafer-scale manufacturing of plasmonic nano-dome arrays for surface enhanced Raman spectroscopy (SERS) applications, and is ready to support your production needs, from developmental projects through commercialization. Potential markets include food safety, pharmaceutical testing, forensics, and point-of-care diagnostics. Figure 2. SERS response for dried R6G dye film on various nano-dome array designs and glass reference. The designs with the thinnest Au coating and smallest dome height (Fabry-Perot (F.P.) spacing) had better performance, while the influence of nano-gap spacing was less pronounced. For enhancement factor calculation, an increased dye concentration and laser power (not shown) were used to obtain weak peaks from the glass reference slide. 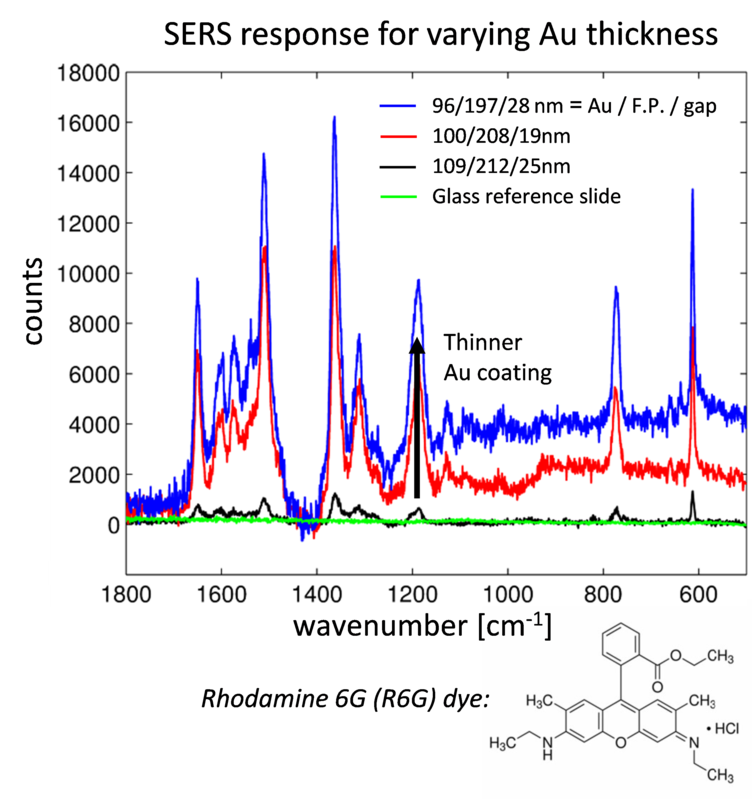 Background-corrected SERS spectra of Rhodamine 6G dye dried onto the sample surfaces are given in Fig. 2 for various nano-dome array designs and for a bare glass reference slide. Measurements utilized a Horiba LabRam instrument with 632.8 nm HeNe laser and a 0.75 NA air objective. The performance and optical response was most sensitive to the Au layer thickness and surface roughness, as well as the separation between reflective Fabry-Perot etalon layers. The gap spacing between adjacent nano-domes was of secondary importance so long as it remained in the 15-30 nm range. The best SERS enhancement was observed for samples with the thinnest gold coatings and smallest Fabry-Perot etalon layer separations, while the influence of nano-gap spacing was less pronounced. No Raman peaks were present for the glass reference slide, even after increasing both the laser power by a factor of 10 and the concentration by a factor of 1000. In order to calculate an enhancement factor the sample was re-positioned away from the center of the dried R6G spot such that the laser was instead focused near the spot edge, where a drying front effect produces even higher dye concentrations. From this concentrated region, weak Raman peaks were evident in the glass reference sample, allowing for the reference measurement. The spatially averaged experimental SERS enhancement factor was then calculated as being at least 1.35 x 105, which is an underestimate of the true enhancement factor since the dye was further concentrated by the drying ring edge effect in the reference sample. Similar nano-dome array designs have shown a 3.16 x 106 spatially averaged enhancement factor,4 with local enhancement factors as large as 1.37 x 108. The larger, local enhancement factors are actually normalized by the ratio of the number of molecules within a hot-spot region to the number of molecules within an un-modified laser focal volume. This calculation assumes that most of the SERS signal is coming from a single hot spot between nano-dome arrays and describes only the enhancement that occurs within that region of highest electric field. It doesn’t account for the experimental fact that only a portion of the available surface area of the substrate is supporting these hot spots. Hence the spatially averaged enhancement factor, in our case greater than 1.35 x 105, is the experimentally relevant parameter. 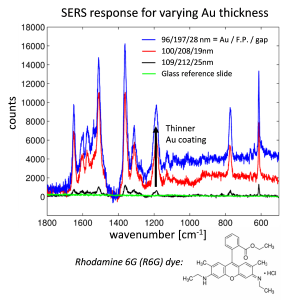 This result for Au-coated nano-domes is within a factor of 25 of previous SERS results on silver-coated nano-dome arrays.4 Current work is focused on gold-coated nano-dome array performance using near-IR excitation, where Gold has improved optical properties, and in underwater evaluation of SERS enhancement for point-of-care diagnostic applications. Figure 1. 2-D SPR nano-dome arrays for SERS applications. (a) Schematic cross section depicting nano-dome height and gap between adjacent nano-domes (Fabry-Perot (F.P.) etalon spacing). (b) Photo of nano-dome array chips. (c) Plan view SEM with inset of perspective view from broken sample showing nano-dome interior. 2-D nano-dome arrays were fabricated and showed sensitivity to the gold coating thickness and surface roughness, and to the Fabry-Perot etalon layer separation. The gap spacing between adjacent nano-domes was of secondary importance. The experimental (spatially averaged) SERS enhancement factor was calculated as being greater than 1.35 x 105 for the design with the thinnest gold coating and about 28 nm nano-gap spacing. These high sensitivity, low cost nanostructures are now available on a commercial scale. Wu, H.-Y., Cunningham, B.T., “Point-of-care detection and real-time monitoring of intravenously delivered drugs via tubing with an integrated SERS sensor,” Nanoscale 6, 5162-5171 (2014). 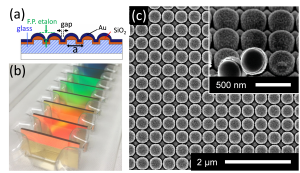 Wu, H.-Y., Choi, C.J., Cunningham, B.T., “Plasmonic Nanogap-Enhanced Raman Scattering Using a Resonant Nanodome Array,” Small 8, 2878-2885 (2012). Choi, C.J., et al., “Biochemical sensor tubing for point-of-care monitoring of intravenous drugs and metabolites,” Lab Chip 12, 574-581 (2012). 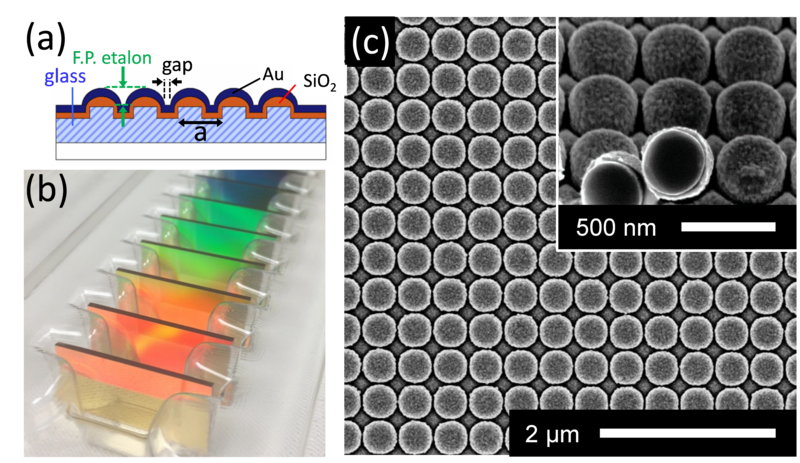 Choi, C.J., et al., “Surface-enhanced Raman nanodomes,” Nanotechnology 21, 415301 (2010).